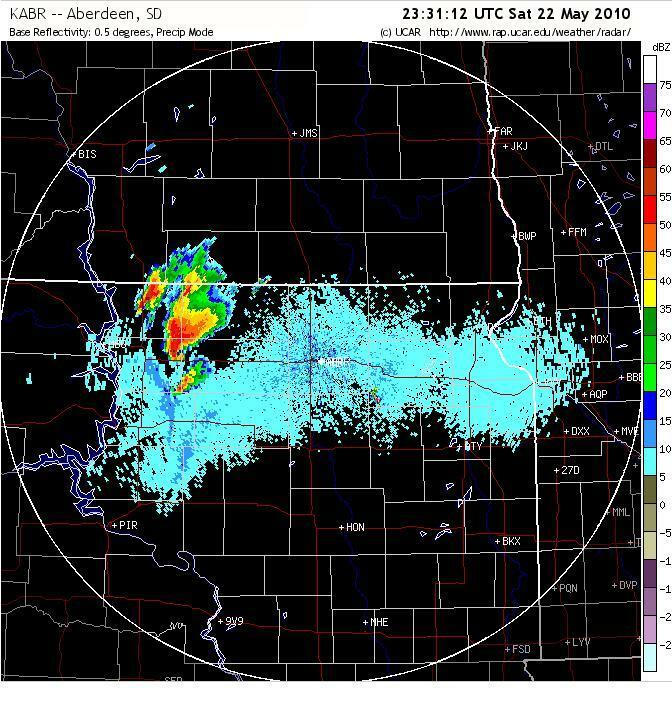 This chase definitely tied with June 24th, 2003 as the best chase of my life! We started the day in Valentine, NE after chasing and seeing a brief tornado in eastern WY the day before. There was an area of low pressure that was progressing towards central ND with another low that was expected to reach central SD by late afternoon. Ahead of this low a warm front stretched from near Pierre, SD down into southeast portions of the state and was slowly lifting northward through the afternoon, as a cold front south of the low slowly worked eastward as well. The idea was to play the triple point near these boundary intersections as models had continued to develop storms ahead of this feature and some held off storms till evening further south where a stout cap was in place, per the special 20Z observed sounding out of Aberdeen that indicated +18 deg C at near 800 mb. There must have been an amazing amount of forcing and convergence on the triple point, because several towers developed by late afternoon and a big storm broke through to the west of Akaska, while we were positioned to the southeast near Gettysburg. This was an incredible environment for this storm to go up in as dewpoints ranged from the upper 60’s into the lower 70’s and even a few 74 degree dewpoints pooling along the warm front and triple point. In addition, it was very unstable with a nose of 4000-6000 j/kg of SB CAPE poking up into the region in a strongly sheared environment due to the southeast winds near 20 kts and some locations gusting over 25 kts at times. 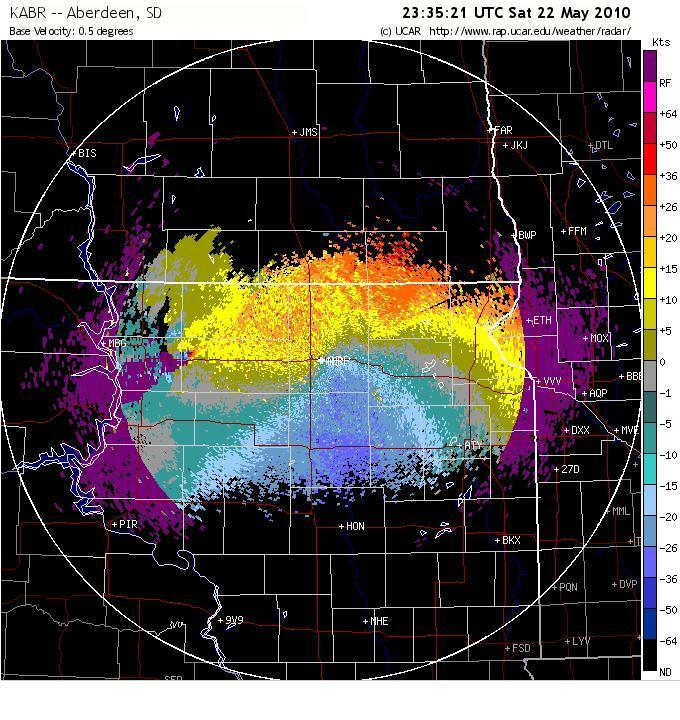 The dry punch into the region from the southwest, as indicated by the drop in dewpoints, likely helped convergence as well and possibly a forecast shortwave that was forecast to move into central SD at the time storms initiated. The storm quickly became tornado warned near Lowry and produced a lowering with rotation soon after. The first tornado of the day dropped northeast of Lowry as a stovepipe and then became an elephant trunk and appeared to weaken. However, the circulation gained intensity upon moving close to us on Hwy 47 and we quickly moved north to stay ahead of this tornado. The tornado crossed Hwy 47 and Hwy 12 shortly after we had moved east and observed the tornado at close range to the road. This is where the tornado downed powerlines and poles, blocking the road from anyone wanting to travel east and stay with the tornado. As we moved towards Bowdle, our plan was to head north on Hwy 47 and observe this tornado that was holding together.It quickly grew into a wedge tornado to the northwest of Bowdle and we were able to experience this mammoth beast at close range as the track continued to take it to the east-northeast. About 1 mile west of Hwy 47 is where the wedge, unfortunately, appeared to hit a couple of farmsteads and one of the families was in their vehicle right next to ours, watching their home get destroyed. It was a sad moment as we tried to console them over their eventual loss. At this point, we became cut off from heading north and needed to head back on Hwy 47 back towards Bowdle and through the RFD winds that were very strong just north of town. We then traveled east on Hwy 12, observing a second tornado near Roscoe and then 3 more weak elephant trunks northwest and then 4-5 miles north of Ipswich. Here is where the storm became very HP and we bailed south on another tornado warned storm near Faulkton where we witnessed incredible storm structure and a couple of funnels that could not quite make it to the ground. What an amazing chase day and one I will never forget! Storm going up right on the triple point near Lowry, SD. 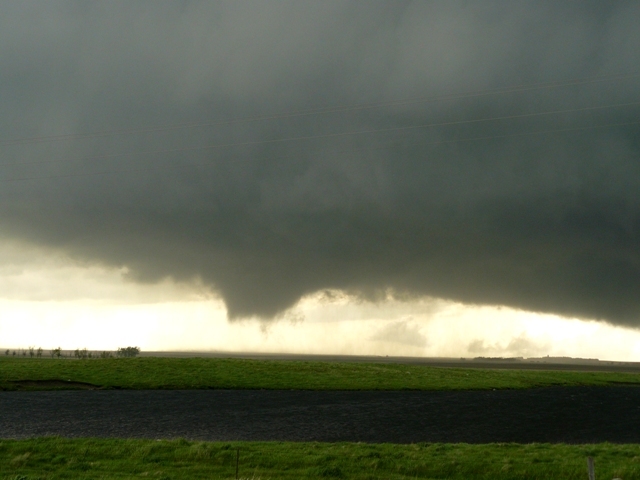 First tornado of the day to the northeast of Lowry, SD. Same tornado starting to become more of an elephant trunk and weaken. Tornado to our southeast as we were driving on Hwy 12 trying to stay ahead of it. Wedge tornado on the ground to the northwest of Bowdle, SD. Getting closer to the incredible wedge tornado near Bowdle, SD. Probably the number one tornado of my life so far to this point! Second tornado of the day touching down very close to Roscoe, SD. 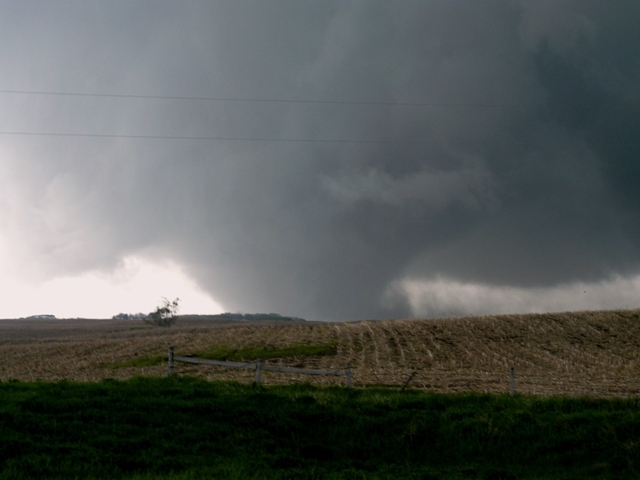 The tornado near Roscoe and the storm structure. 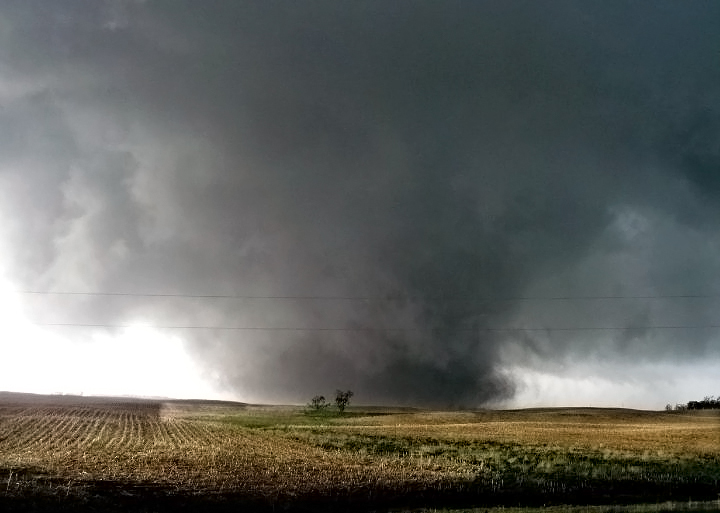 Closer view of the tornado near Roscoe, SD. The third tornado of the day touching down northwest of Ipswich, SD. 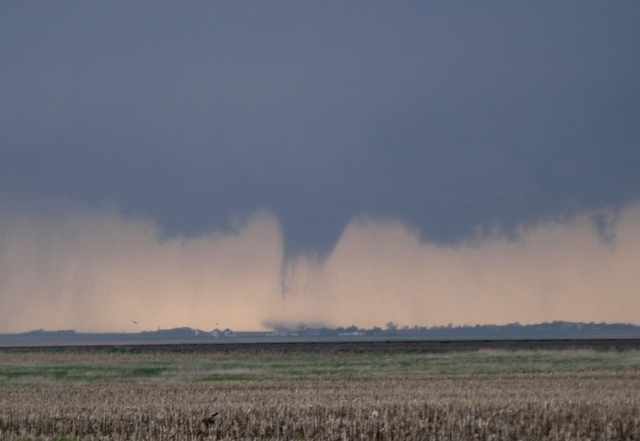 Blurry photo showing the fifth tornado of the day around 4-5 miles north-northwest of Ipswich, SD. A different storm near Faulkton, SD with awesome structure and stacked plates.